Enjoy the freedom of discovering Amsterdam by bike! Why spend your Amsterdam city trip on a bike? Everyone knows the Netherlands as the bicycle capital of the world. When you arrive in Amsterdam, you immediately know why. 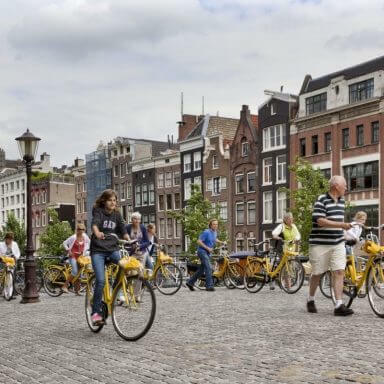 Hardly any other city in the world relies on the bicycle as much as Amsterdam. Approximately 40 percent of all journeys are made by bike. If you are planning on enjoying a city trip in our gorgeous capital, I would definitely recommend you to do it on two wheels. My idea of the perfect stay in Amsterdam would have the bike rental shop as my very first stop. The bicycle is the most convenient means of transport in Amsterdam. It’s the easiest way to get from point A to point B, and back again. Many cyclists keep a bike at the train station, delivery services deliver their goods by bike, most people do their shopping by bike, young children go to school on the back of a bike, even the police ride bikes. And as a tourist, a bicycle is almost a necessity. If you already know a little about this city, you will understand why. The 17th century city centre is difficult to reach by car, and if you have beaten the odds and reached your city centre destination on time, you’ll be very lucky if you find a parking space. And if you do find one, you will have to dig deep to pay for the privilege. Public transport in Amsterdam is good, but you can’t see all of the wonderful sites from the window of a packed tram, bus or subway train! It’s time to visit the bike rental shop! It’s easy to rent a bike in Amsterdam. However, you should know where to rent one. One disadvantage of riding bicycles in Amsterdam is that it is always busy and traffic will come at you from every corner and side street (speeding cars, whizzing mopeds, trams ringing an alarm, and reckless couriers), so you should certainly take care . But if you have been given a bike with faulty brakes, this won’t help the situation. In fact, it will make your journey dangerous. I advise you to rent your bike here. For just a few euros a day, you are guaranteed a properly functioning, safe bike with the peace of mind that your bicycle will be ready and waiting for you when you arrive, you can start discovering its many treasures straight away! Much cheaper than traveling by car or public transport. On a bike, tourists can easily travel through the narrow streets and along the canals. Amsterdam has a huge number of amazing places to see, and with hundreds of kilometres of cycle paths you will be able to get to any number of them, enjoying the incredible scenery along the way. Taking the bike also means you will have the time to combine a range of activities while traveling through our impressive city and discovering its rich history. As far as I am concerned, there is no better way to discover Amsterdam than by cycling along its canals and scaring off the oblivious pigeons with a quick ring of the bell. It’s great to be able to visit the more well known sites like the Rijksmuseum, the Albert Cuyp market, the Anne Frank house, the Vondel park, the old Heineken Brewery or Madame Tussauds, but I can also highly recommend using one of the many cycle paths to get off the beaten track and discover the lesser known Amsterdam. Take the time to cycle through the places most tourists don’t get to see. In each district, you will be pleasantly surprised by the stunning architecture with both modern and traditional facades, the cool shops and the cosy cafes and restaurants you will encounter on your way. My tip for a great bike ride would be to head for the district of North Amsterdam. Take the ferry to the IJ and visit picture-perfect places like Nieuwendammer harbour, the D’Admiral chalk mill, Vogeldorp and Noorder park. The advantage of riding around on a bike during your time in Amsterdam is that you will have the opportunity to visit places that are almost impossible to reach by car or public transport, like Diemerpark’s beach and some areas in the old Jordaan district. The latter of the two is a must see when spending time in the city. If you haven’t been through this historic, bustling neighbourhood and its collection of picturesque streets and canals, you haven’t really been to Amsterdam. What you most definitely should see is Amsterdam at night. Sparkling lights combined with a fantastic nightlife will change your perception of this heirloom city. Your rental bike will have lights, so use them! Visitors love to experience places like the Westerkerk, Muiderkerk, Ooster park and smaller museums such as the Museum of Bags and Purses, the Biblical Museum, the Museum van Loon and the Dutch Resistance Museum. And the red-light district, of course. From November 30, 2017 to January 21, 2018, the Amsterdam Light Festival is definitely worth a visit to Amsterdam; riding your bicycle through this spectacle will be an experience you never forget. Thanks for the tip. I am about to visit Amsterdam and I’ve been looking for ways to totally enjoy my visit there. 657 visitors rated Bicycle Rental average 4.56 stars out of 5.